Create awesome looking pixel art games with this high quality characters pack, for medieval-fantasy games! Each character was carefully designed and animated by experienced pixel artists. The pack contains over 30 high-quality animated characters as well as over 10 animated enemies and various other bonuses and eye-candy! See the animations in action here! Note : The environment shown in the screenshots is taken from our other pack, Pixel Art Parallax Woods Pack. 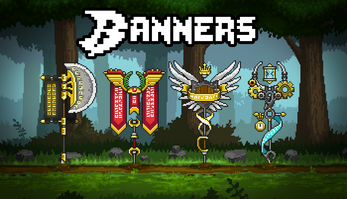 Check it out of you are looking for a gorgeous pixel-art forest sporting parallax layers! Keep in mind there is no run loop available for the characters. If you want to move them around, you can use the small dash loop which is suited for very fast changes of position - might not be suitable for all movements. In addition to these, some of these characters have extra elaborate FX for attacks, which have been exported separately from the attacks themselves (allowing you to either use them for other things, or simply spawn them separately to add special post-processing on them or have remanence). Most of them also have special animations depending on the enemy. For example, the mage has an animation where he appears in a puff of smoke, or the bomber has an animation where he blows up with the big bomb he is rolling. Every animation comes in separate frames, so you can create spritesheets as you wish. 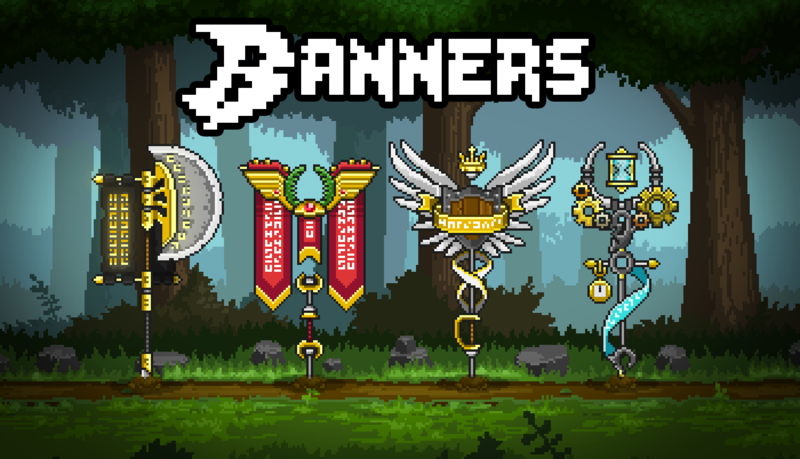 You can contact us if you want already-made spritesheets. 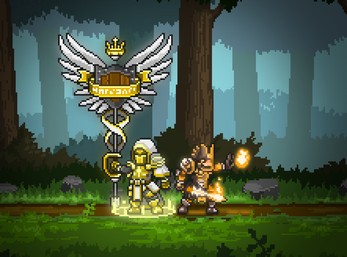 To go with this background, take a look at our brand new Pixel Art Medieval UI Pack! Medieval Fantasy Characters Pack update 1.2! Medieval Fantasy Characters Pack update 1.1! great work, i'd definately buy it if there were walking animations. Hello! I bought your all bundle pack and it really good. but if I can ask for, could you add basic walking motion for characters? A nice asset pack for characters! Bought and wont be asking for a refund, even though I can't use it as-is. Just a heads up for others, there are a few things with the pack that you will need to do yourself, depending on what you would like to use it for (just remember it cant be used commercially). I don't know if doing this violates the "non-derivative"rule here, apologies if so. The sprite sheet(s) are combined with non-uniform sizes and origin points, so you will have to either have an atlas manager that can accept several region grids at once, or (as is more common), import animations per-frame/split the sheets into smaller ones per-animation. Secondly, the character's origin isn't always in the middle of the frame, so make sure when you switch between animations that you move the sprite several pixels in the right direction so your character doesn't jiggle. Thirdly, many of the animations have no reset action. After the "climax" of the action, such as swinging a sword, there are no frames for bringing it back. Either allow a pixel jump, or just use one of the middle frames again really quickly as a filler. The actions are in a jumpy style, with three frames for most (obviously ment for slow frame timers), and the FX shots are really cool! A pretty good pack, happy with the purchase. Cheers! Hey Derez, thank you very much! Generate in a format that is friendly to our engine. For example we use LibGDX as our graphics framework, so we use a special spritesheet creator which produces atlases and JSON data files that work well with it. But if you're using Unity, it wouldn't work at all. What you said about the origin is quite weird, I think it might come from the spritesheet! All the animations have been designed with the origin point in the middle of the frame so that you can play them without having to move the Actor around. All the frames of the same animation are of the same size and work when you just display them one after another. Or maybe you meant something else? 100% true about the reset action for the animations, there's no bringing it back. It goes together with your last point (few frames), the animations were designed for a fast paced game which required quick and efficient animations (so a woosh + a theatral pose). They are less suited to slower paced games or games with more detailed animations (even though they can make an efficient placeholder in the meanwhile, or you can hack around like you said and reuse another frame as a middle pose). Hello, i bought this asset yesterday and took a look at it. Due to all sprites being glued together, i have no use of this. All in all this is an amazing asset for the price, but i dont have any use of it. For anyone that want to use the characters and not only the clothes, i recommend buying this pack. I would like to have a refund, many thanks. Thank you for your feedback Zixty! Indeed, the clothes and characters are included in the animations so reusing only the clothes and putting your own characters heads on the animations will require some work erasing these parts from the original animations. It's definitely doable given the low resolution of the assets, but it might not be something you would want to do. Have you contated itch.io yet? Thanks for your interest! The itch.io version is non-commercial and non-derivative but you can reach us at contact@cleancutgames.com if you want to buy a commercially-usable version of the packs! It's more expensive but you will be able to use it in any number of commercial games you want. Feel free to contact us! Great work! I like so much! More enemies or scenaries will be fantastic in futures packs! Glad you like it, thank you very much! Could the clothing of the character be used as armor? I already have a main character and would like to use every piece of clothing as armor & wings etc. Would that work or is the sprites "glued" together? Each frame comes as one single layer! So the armor is not separated from the body (like you said, it's "glued" together). However, since these are quite low resolution assets, it would be easy for you to just cut the armor pieces manually, and reuse them for your character! Most characters have similar proportions, so you can even use like, the executioner armor with the knight's gloves for example. Does that make sense ? Awesome! If i buy it and not happy with it, is a refund possible? Just bought this asset. It's full of wonderful sprites and effects, but I can't found the run loop for the characters. The enemies do have the run loop animations, but no the characters... Did you forget to include these animations in the last update? Hey Digipure, thanks for your purchase! Unfortunately the characters do not have a run loop, as shown in the animations list on the pack's page. They were designed for a static use, any movement being handled by the small dash loop (which means they must be fast movements). We will add an additional note on the page as this might not be obvious enough, especially as the enemies do have a run loop like you said! If that is a dealbreaker for you - which is perfectly understandable -, you can ask for a refund at support@itch.io (or we can ask for a refund for you, that's up to you!). In any case, thanks for letting us know this was confusing, we will clear that up! Even with no run cycle there’s still enough content in the pack at this price for me, so I will keep it; thanks! You should read again your description, because you are listing a run cycle in the list of included stuff and then saying it’s not included in the next paragraph. And, of course, if you are considering further updates to this asset, think first in the walk cycle ^_^! PS: Also a flying idle animation for the winged characters will be a nice addition! Thank you, we hadn't noticed that "run loop" was in the bullet list! That's fixed and we added a special warning at the bottom of the list just in case! Hi I bought this and these are really nice. and I want to get already-made spritesheets. how can I get this?? I couldnt find e-mail address so I post here . Hello Yukitama, thanks for your purchase !